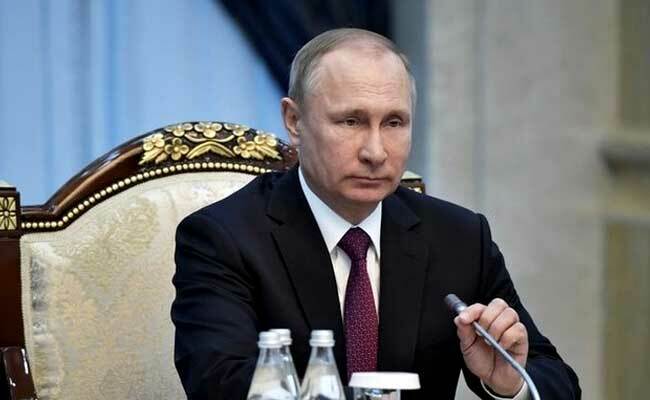 Moscow: Russian President Vladimir Putin condemned US cruise missile strikes on Syria as illegal on Friday, warning the move would further damage already battered US-Russia relations which Moscow had hoped President Donald Trump would revive. US officials said they had informed Russian forces ahead of the strikes - intended to punish the Syrian government for what they say was a chemical weapons attack earlier this week - and had avoided hitting Russian personnel. Satellite imagery suggests the Shayrat air base that was struck in western Syria is home to Russian special forces and military helicopters, part of the Kremlin's effort to help the Syrian government fight ISIS and other terrorist groups. Russia's main air base and a naval facility were not hit. Moscow had been hoping to cooperate with Trump to jointly fight ISIS in Syria, a move it was banking on to boost US-Russia ties which are at a post-Cold War low. After the US strikes, that task now looks harder. "President Putin views the US strikes on Syria as aggression against a sovereign state in violation of the norms of international law and on a made-up up pretext," said a Kremlin statement. "This step by Washington will inflict major damage on US-Russia ties." Putin, a staunch ally of Syrian President Bashar al-Assad, was holding a meeting of Russia's Security Council to discuss the strike on Friday afternoon and the Russian Foreign Ministry called for an emergency meeting of the UN Security Council. A foreign ministry statement said Moscow was suspending a Syrian air safety agreement with the United States originally drawn up to ensure that the two countries' planes did not collide. "It's clear to any specialist that the decision to launch a strike was taken in Washington before the events in Idlib (the province where the gas poisoning took place) which were simply used as a pretext for a show of force," the ministry said. Dmitry Peskov, Putin's spokesman, told reporters the US strikes had been conducted to help rebel groups fighting Assad. Russia would keep military channels of communication open with Washington, but would not exchange any information through them, he added. When asked whether Russia had deactivated its own anti-missile defence systems in Syria before the missile strike, Peskov declined to comment. The Russian Defence Ministry meanwhile mocked the effectiveness of the US strikes, saying only 23 missiles had found their targets. It was unclear where another 36 had landed, it said, promising Syrian air defences would now be beefed up. A Russian frigate armed with Kalibr cruise missiles sailed through the Bosphorus en route to the eastern Mediterranean in the early hours of Friday morning, according to pictures taken by Turkish bloggers for their online Bosphorus Naval News project. It was unclear if that was related to the US strikes. Foreign Minister Sergei Lavrov said there were no reports of any Russians being hurt in the attack. He said he hoped US-Russia ties would not be irreparably hurt as a result. Rex Tillerson is due to make his first visit to Moscow next week as US secretary of state, an eagerly awaited event in Russia where politicians have been anxious to try to use the change of administration to reboot relations. One senior Russian lawmaker, Leonid Slutsky, told the Russia 24 television channel on Friday Moscow should use the Tillerson visit to "try and talk sense into Washington". Syria, ironically, was one of the few areas where analysts believed Moscow and Washington might be able to find common ground. The Kremlin says Washington's allegations that the Syrian army possesses and used chemical weapons are flat out wrong and accuses the West of ignoring rebel use of such weapons. It says scores of Syrians were killed by poison gas on Tuesday because the Syrian air force had struck a terrorist bomb-making factory which it said contained chemical weapons procured in Iraq. Western countries have dismissed this version of events and say Syrian planes dropped the gas, which Assad denies. The Kremlin said on Friday the US attack had thrown up a "serious obstacle" to the idea championed by Trump during his election campaign of creating an international coalition against terrorism. Konstantin Kosachev, chairman of the upper house's international affairs committee, said it looked like Trump may have been pushed into approving military action by the Pentagon and US intelligence agencies. "One way or another, Russian cruise missiles are continuing to strike terrorists and American ones government troops who are heading the war against the terrorists," Kosachev wrote on social media. "I fear that with these approaches the hoped-for US-Russian anti-terrorism coalition in Syria ... is breathing its last before it is even born."